Operating in the Milwaukee area from 1888 to the present, the Patrick Cudahy Corporation is one of Milwaukee’s historic meatpacking giants. The company originated in the packing firm of John Plankinton, a successful enterprise due in large part to the lucrative partnerships that he established with other budding packing moguls from the early 1850s through the late 1880s: Frederick Layton, Philip Armour, and Patrick Cudahy. Patrick Cudahy moved from Ireland to Milwaukee with his family in 1849, shortly after he was born. He learned the meatpacking trade as a teenager, working as a carrier, pickler, packer, and weigher for several companies. In 1873, the short-lived Lyman & Wooley (Packing Company) hired Cudahy as superintendent. The next year, Plankinton & Armour called on Patrick to replace his older brother Michael as their superintendent. A decade later, Armour left this firm and Plankinton promoted Cudahy to junior partner. In 1888, Plankinton sold the firm to Patrick and John Cudahy for $600,000 and leased his Menomonee Valley packing plant to the new Cudahy Brothers Company for five years. The need for facilities prompted the Cudahys to relocate their firm to Buckhorn, a small town two miles south of Milwaukee, along the Chicago and North Western Railroad. They opened a large, modern plant at their new location in 1893. The nearby area, formally incorporated as Cudahy in 1895, was gradually transformed into an industrial suburb. Like Plankinton before it, Cudahy Brothers processed a variety of animals, but specialized in pork products. The new facilities were able to process as many as 7,000 hogs a day. This increased capacity helped the company expand its distribution into European markets. The company continued to flourish through the early-to-mid twentieth century despite some notable struggles. For instance, a major fire destroyed nearly one-third of the Cudahy plant in September 1906. The company also experienced barriers to its largest foreign market as Congress enacted new tariffs in the years following the First World War and Great Britain responded with mandates that agricultural products, like meat, be imported from Commonwealth countries rather than the U.S.
Patrick Cudahy prided himself on maintaining an “open shop,” and the company fought frequently and fervently to thwart union organizing efforts throughout its history. During the Second World War, Cudahy Brothers supplied large amounts of meat to the military but refused to comply with the National War Labor Board’s order to maintain union membership and dues checkoff systems. In order to avoid a potential disruption to wartime production and force the company’s compliance, the U.S. Army seized the Cudahy plant under presidential order on December 8, 1944, and continued the occupation until the end of the war. The Cudahy family maintained control of the firm until 1971, when they sold it to Philadelphia-based Bluebird, Inc. Several corporate buyouts took place until, in 2013, a Chinese meat processing company purchased Smithfield Foods, Inc. and, with it, the firm once known as Cudahy Brothers. Over the last decades of the twentieth century, the company weathered significant struggles. For instance, Cudahy workers went out on strike in January 1987 after the company cut wages and benefits to make the company more competitive. This particularly bitter strike lasted nearly 28 months, ending after a group of workers failed in an attempt to purchase the company in April 1989. During the July Fourth weekend of 2009, an illegally obtained military flare landed on the plant’s roof and sparked a major fire that nearly destroyed the entire complex. This event—which has been characterized as the largest structural fire in Wisconsin history—caused $187.7 million in damages and displaced 1,400 workers for approximately three months before the complex was rebuilt and restored to operation. Patrick Cudahy remains Milwaukee’s last meatpacking center, making bacon, ham, deli meats, and a variety of other pork products. 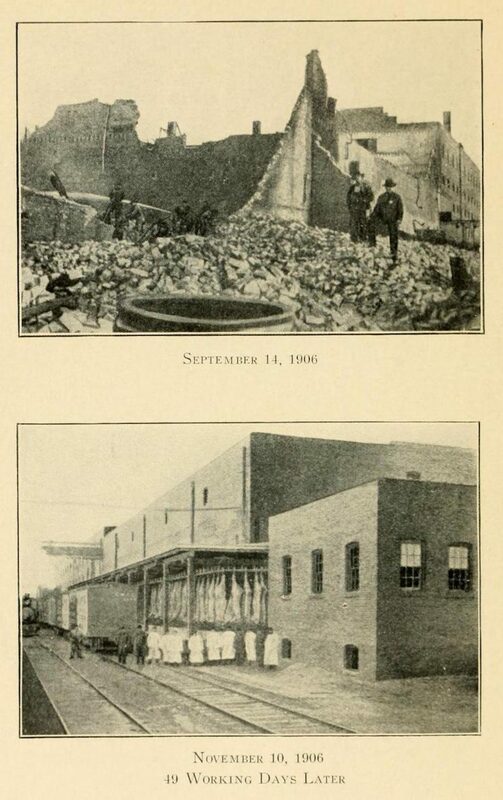 ^ Paul E. Geib, “‘Everything but the Squeal’: The Milwaukee Stockyards and Meat-Packing Industry, 1840-1930,” Wisconsin Magazine of History 78, no. 1 (Autumn 1994): 15; Patrick Cudahy, Patrick Cudahy: His Life. (Milwaukee: Burdick & Allen, 1912), 13-16. ^ Cudahy, Patrick Cudahy, 43-47, 54, 60. ^ Cudahy, Patrick Cudahy, 73-76; “Patrick Cudahy,” in Who’s Who in America, vol. 3, ed. John William Leonard and Albert Nelson Marquis, (Chicago, IL: Marquis Who’s Who, 1903), 344. ^ Cudahy, Patrick Cudahy, 76-77, 89. ^ Geib, “Everything but the Squeal,” 15; Cudahy, Patrick Cudahy, 101; Bayrd Still, Milwaukee: The History of a City (Madison, WI: State Historical Society of Wisconsin, 1948), 333-334. ^ Patrick Cudahy, Inc., Celebrating 110 Years of Goodness: Patrick Cudahy, 1888-1998 (Cudahy, WI: Patrick Cudahy, 1998), 2; Geib, “Everything but the Squeal,” 15; Cudahy, Patrick Cudahy, 110-111; Still, Milwaukee, 334. ^ Patrick Cudahy, Inc., Celebrating 110 Years of Goodness, 2; Geib, “Everything but the Squeal,” 15-16; Cudahy, Patrick Cudahy, 114-115, 131-132, 136-139; John Gurda, The Making of Milwaukee (Milwaukee: Milwaukee County Historical Society, 1999), 168-169, 183-184. ^ Patrick Cudahy, Inc., Celebrating 110 Years of Goodness, 11. ^ Geib, “Everything but the Squeal,” 16; Patrick Cudahy, Inc., Celebrating 110 Years of Goodness, 5. ^ Patrick Cudahy, Inc., Celebrating 110 Years of Goodness, 4-5. ^ Patrick Cudahy, Inc., Celebrating 110 Years of Goodness., 6; Cudahy, Patrick Cudahy, 193-194. ^ Patrick Cudahy, Inc., Celebrating 110 Years of Goodness, 8. ^ Cudahy, Patrick Cudahy, 134-135; Jonathan Rees, “Caught in the Middle: The Seizure and Occupation of the Cudahy Brothers Company, 1944-1945,” The Wisconsin Magazine of History 78, no. 3 (Spring 1995): 205-206. ^ Rees, “Caught in the Middle,” 207-208. ^ “U.S. Runs Cudahy Plant,” Milwaukee Sentinel, December 9, 1944, sec. 1, pp. 1, 2; Rees, “Caught in the Middle,” 200-201, 214-216. ^ Patrick Cudahy was succeeded as company president by his son, Michael, after he died in 1919, and Michael was succeeded by his son, Richard, in 1961. Patrick Cudahy, Inc., Celebrating 110 Years of Goodness, 8, 11-12. ^ Patrick Cudahy, Inc., Celebrating 110 Years of Goodness, 14-15; Jeff Engel, “Patrick Cudahy Won’t Change Much under New Chinese Parent Company,” Milwaukee Business Journal, October 3, 2013. ^ Patrick Cudahy, Inc., Celebrating 110 Years of Goodness, 15; Michael Gordon, “Memory and Performance in Staging The Line in Milwaukee: A Play About the Bitter Patrick Cudahy Strike of 1987-1989,” in Remembering: Oral History Performance, ed. Della Pollock (New York, NY: Palgrave Macmillan, 2005), 86-87; Jeff Cole, “2-Year Strike Over at Patrick Cudahy,” Milwaukee Sentinel, May 1, 1989, sec. 1, pp. 1, 7. ^ Tom Held, “Fire Guts Cudahy Meat Packing Plant,” JSOnline, July 6, 2009, http://www.jsonline.com/news/milwaukee/50091637.html; Joe Taschler, “Soon, Patrick Cudahy Will Begin Rebuilding,” JSOnline, March 21, 2011; Bruce Vielmetti, “Judge to Decide How Much U.S. Owes in Patrick Cudahy Fire,” JSOnline, November 24, 2015. Patrick Cudahy, Inc. Celebrating 110 Years of Goodness. Cudahy: Patrick Cudahy, Inc., 1998. Cudahy, Patrick. Patrick Cudahy: His Life. Milwaukee: Burdick and Allen, 1912. Rees, John. “Caught in the Middle: The Seizure and Occupation of the Cudahy Brothers Company, 1944-1945.” Wisconsin Magazine of History 78, no. 3 (Spring 1995): 200-218.